Looking for the perfect alternative to “vending machine” snacks? 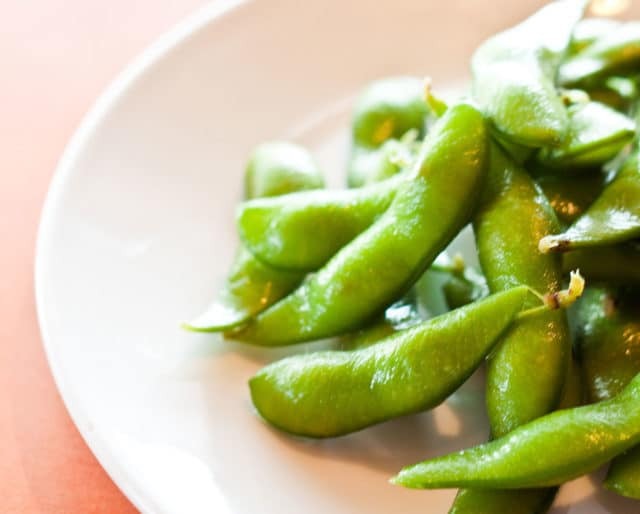 This April, celebrate National Soy Foods Month and discover the popular substitute to today’s traditional grab-and-go bites. Soy foods are loaded with healthy nutrients and protein. They also have lower cholesterol and saturated fat levels than animal foods. The result? A multitude of healthy snack options for you and your family. Nearly one-third of the world’s soybean supply comes from America. An American colonist in Georgia planted the first soybean seed from China. The earliest Japanese textual reference to the soybean is in the classic Kojiki (Records of Ancient Matters). Soybeans were a crucial crop in East Asia long before written records began. There is evidence for soybean domestication around 7000 BC in China, 5000 BC in Japan, and 1000 BC in Korea. Got soy? Milk derived from soy is high in protein, calcium, essential nutrients, and omega-3 fatty acids. Move away from red meat and reach out for a veggie burger. Soy is a common ingredient used in meatless burgers, offering a delicious alternative with lower saturated fat and cholesterol. Soy protein bars are not only an easy and delicious snack, they're packed with protein, vitamins, and minerals — perfect for post-workout recovery. According to the ancient Chinese myth, the legendary Emperor Shennong of China proclaimed that five plants were sacred: soybeans, rice, wheat, barley, and millet. The global production of soybeans has reached 337 million tons. Once the US secured tariff-free access for its soybeans to the European market, its share of worldwide exports jumped to over 90%. Even though China discovered soybeans, the nation remains the world's top importer. They can lower cholesterol, ease symptoms of menopause, and improve bone health. Ounce for ounce, there's no other single food that supplies as much nutritional value as the soybean, which acts as a source of protein, unsaturated fats, fiber, B-vitamins, folic acid, potassium, calcium, and zinc. Soybeans have the lowest glycemic index of any food — leading to more stable blood sugar. That means fewer mood swings.